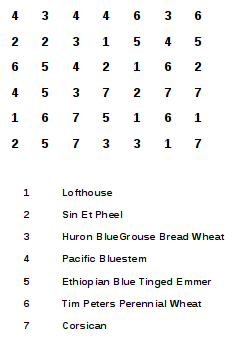 I have been trialing wheat varieties the past few years. I found 4 that are productive enough to please me. Lofthouse. My great-great-grandfather's variety, developed on my farm. Sin Et Pheel. An ancient variety from the middle east. Huge seed heads. Large kernels. I'm growing two other varieties that I'm intending to include because of unique qualities. Ethiopian Blue-tinged Emmer. Purple kernels. Very low productivity. 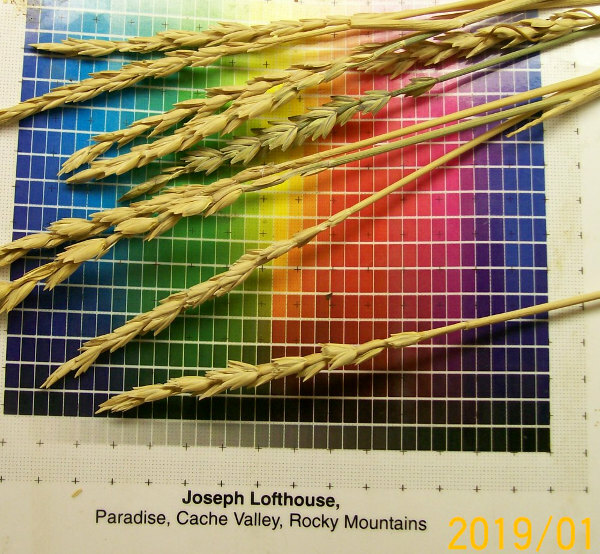 And I will include Corsican wheat if I can find the seeds. Huge kernels. 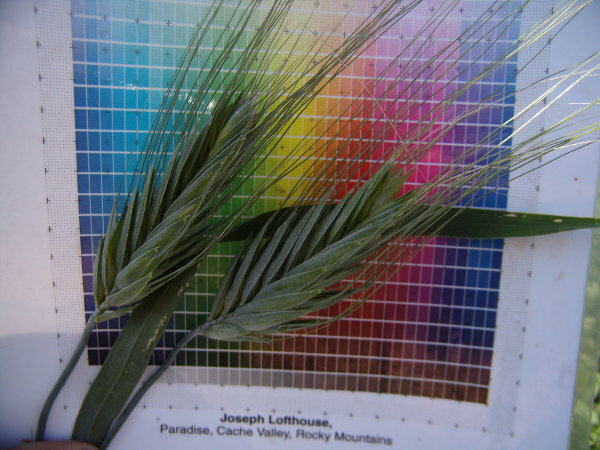 My intention is to plant them on a grid, and then harvest by variety, and plant out rows of each variety, and watch for naturally occurring hybrids. 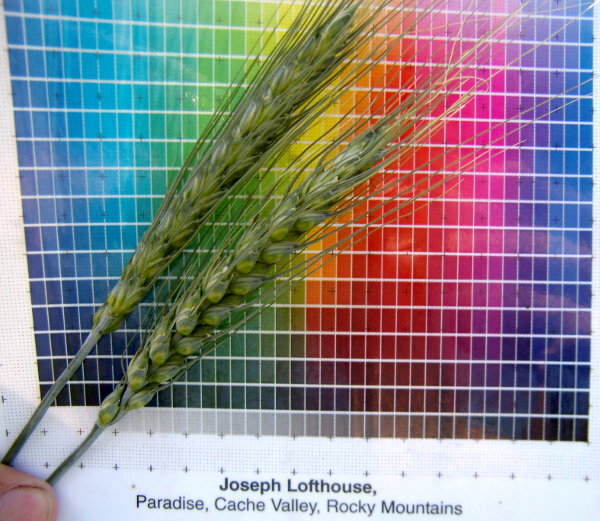 Low humidity favors cross pollination in wheat, so that's encouraging since my climate is very arid. The seed head on Sin Et Pheel is uniquely distinctive. Ethiopian Blue-tinged Emmer has uniquely purple seeds. Tim Peter's wheat has a unique seed head. So they might modify the phenotypes enough to be able to identify hybrids. I might claim that I do plant breeding as an artist, but I still generated a randomized planting map for seven varieties. I'm planning for 6 plants of each variety, cause that matches the pots that I'm intending to grow the seedlings in. I'm planning to start 3 sets, 2 weeks apart, and planting them next to matching plants, in case flowering times are not synchronized. Last summer, a collaborator gave me some maxima squash that she had grown. Thinking that they might get added to my landrace. Two of the three varieties were so hard that I couldn't even cut them open! One had a woody skin. The other was just hard fleshed in general. I hadn't realized that over the years I have been selecting for soft fruits that are easy to handle in the kitchen. Today, the germination test for Solanum habrochaites finished. It germinated at 100%, and was the quickest to germinate of any of my tomato varieties... That was startling to me, because I have a note in my seed catalog that germination on S habrochaites is erratic, and that germination can be expected in flushes every few weeks. Ha! I suppose that during the 4 generations that it has grown on my farm, that I inadvertently selected for quick germination. What sorts of inadvertent selection have you noticed with your seed saving? Community & Forum Building / Accidentally Banned Australia -- Sorry about that! Deepest apologies to our collaborators in Australia! I apologize that earlier today I was dealing with a cyber-attack, and in the process of putting it out, I accidentally banned the entire continent. I feel terrible about that. Thanks for bringing it to our attention in a timely manner. Edit to add: I Double Banned Australia. Fixed that too. Hopefully everything is working properly now. My first breeding project, and still my favorite was cantaloupes. 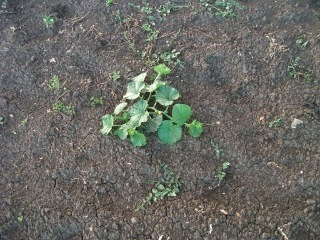 I gathered seeds from perhaps 60 varieties of cantaloupes and planted them together in a field. Many varieties died young. Many grew poorly and didn't produce fruits. A few did marginal and produced seeds. I saved the seeds and replanted. About the third year, I was harvesting a hundred pounds per picking. The first couple years, the only selection criteria for the cantaloupes was, "Must produce viable seeds, no matter how immature". 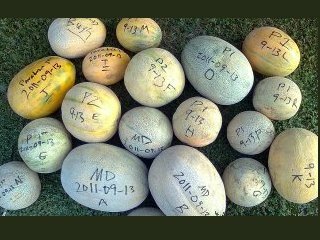 Once the cantaloupes were reliably producing mature seeds and ripe fruits, then the selection criteria changed to must taste and smell great. For years I have been tasting every fruit before saving seeds. The fruits must be sweet as can be, and smelly as anything. I realized after a few years, that I was calling my cantaloupes by the wrong name. They should be called muskmelons! They bear little resemblance the hard, bland "cantaloupe" sold by stores. 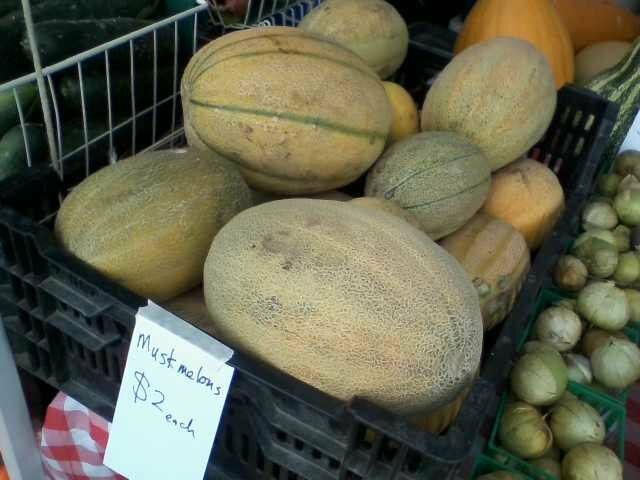 So these days i only take muskmelons to the farmer's market. They have a loyal following of people who crave the glorious taste and wonderful smell. 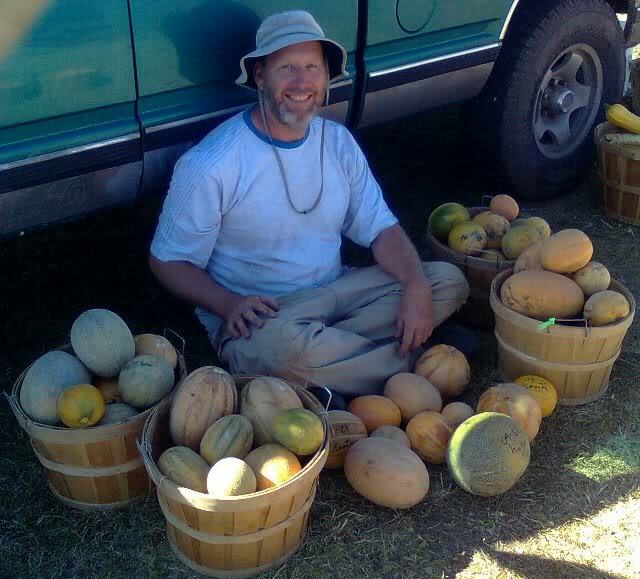 One day, I put a couple baskets of muskmelons in the cab of the truck with me. That was a fragrant ride! And, they actually grow in my cold mountain valley. One lady told me that she's been trying for years to grow muskmelons here in the valley, and mine was the first ripe fruit she ever harvested. If I accomplished anything with my farming, that's about as nice a compliment as I can imagine getting. While developing this variety, I collaborated closely with another grower in my valley. We each grew muskmelons, and swapped seeds with each other for a number of years. Each of us contributed our last name to the variety. 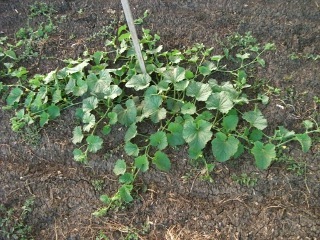 This is what a typical variety of cantaloupe looks like when grown in my garden, if it even survives this long. This is what my variety looks like when planted and photographed on the same day, growing a few feet away. 100 pounds of melons per week! For years, I have loved playing with hybrid beans. I watch my fields closely for naturally occurring hybrids, and plant them preferentially the next year. Collaborators send me hybrids they find in their gardens. I love them!!! Andy B has been hand pollinating beans and sharing the seed with me. The past few years, I have grown F1, F2, and F3 tepary beans that he shared with me. What a wonderful way to select for local adaptation! The segregating hybrids have been very productive for me. 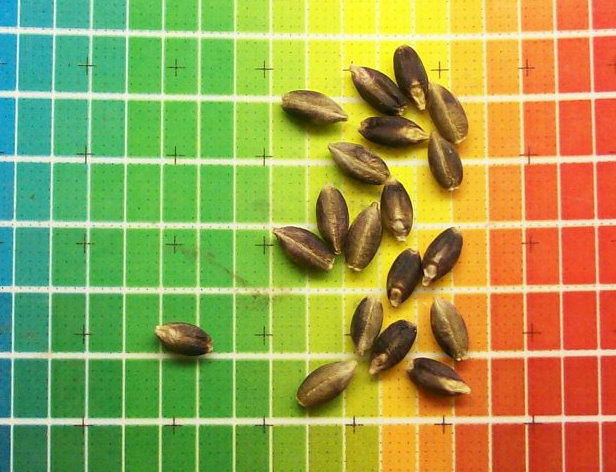 With every seed being genetically unique, it is like trialing hundreds of varieties each year. This year Andy also shared F1 interspecies hybrid bean seed with me: Common beans X Runner beans. The cotyledons were located mid-way between typical of common beans and runner beans. The flowers were scarlet, but paler than is typical of scarlet runners. The bean pods looked like runner beans. The seeds looked like runner beans. They were almost too long season for my garden. The night before hard frost, I collected pods to try again next year. The pods were very green. Some of them produced seed that looks viable. There is a nice stash of seed. Some years ago, Tim Springston of Oxbow Farm shared hybrid common beans with me. I reselected for bush type, and they have been part of my landrace ever since. One of my favorites I call Oxbow Farm Black Anasazi in my personal notes. The other beans in that photo also came from Tim's hybrid. Of the wild tomato species, Solanum, pennellii has been the most difficult for me to work with. 1- The seeds are very small. Therefore young plants are also small, and delicate. Highly susceptible to damping off. 2- The root system seems weak and fragile. Seems like a little disturbance kills the plant. The plants haven't sent out roots from the stem, so growing cuttings is problematic. 3- The type of soil it grows in has a huge impact on plant growth. I managed to grow a respectable amout of seed this year in pots, that were shaded mid-day, and received morning and afternoon sunlight. The potting mix was 100% compost. Not just any compost, but a specific batch of compost, which is the only type of compost/soil that the plants did well in out of about a half dozen that I tried. Solanum pennellii seems to do better if it is misted rather than irrigated, so I watered with a jet of water across the plants, rather than irrigating the soil. So for those of you attempting to grow Solanum pennellii, I highly recommend starting seeds in a dozen different potting mixes, and then choose to grow your population in the one in which it thrives. And minimize transplanting. Maybe it wouldn't be an issue in a high humidity climate, but for me, where it is super arid, I need every advantage I can get. moisture. But the plants that were grown in pots only did better. Solanum pennellii is self-incompatible, and the shape of the anthers is cylindrical rather than conical. The stigma is exerted to highly exerted. The leaf shape is highly conserved in the offspring of interspecies hybrids with domestic tomatoes. I grew F2 hybrids this summer of a cross between domestic tomatoes and S pennellii (Thanks Andrew). There were huge differences in vigor between plants. Community & Forum Building / Let's build the best plant breeding forum on the Internet. The Open Source Seed Initiative has dedicated time and resources to host a plant breeding forum. A big thank you to the board, donors, and volunteers who have made this forum possible. What would you like to see in a plant breeding forum? What forum categories do you think are appropriate? What questions should be added to this list of things to think about?